That Cardassian space station is taking over my thoughts. Plus, Tim and I are recording again…Oh, and I’m famous!! DS9: So, I’ve been slamming pretty hard through Deep Space Nine lately. Started on Thanksgiving and just finished Season 5 a couple of days ago. This is a big deal because I pretty much skipped DS9 when it was on the air. That’s okay. Now is totally the time to be watching this. I’ve been enjoying the heck out of it. But I have noticed…side effects. Like, the other day I saw a sign on the highway for a local car dealership. It’s called Grubbs Honda or Nissan or whichever. Anyway, I saw the sign and for a split second, I actually thought it said “Tube Grubs.” Not that it made me think of that particular Ferengi delicacy, but that, in seeing the word “Grubbs,” I immediately added “Tube” in front of it in the assumption that it was there. Why on Earth I thought there would be a sign for tube grubs on the highway, I’ve no idea. Plus, I remember waking up from a dream while Captain Sisko was in the middle of saying, “I’m sure Dax and Mr. Bean can figure it out…” Dax and Mr. Bean?? Something is seriously wrong with me. Commentaries: I’ve talked about them for ages, but they’re really coming!! Tim and I have been working hard on episode-by-episode commentaries for TOS and TNG. This is not easy. For all our love of Star Trek, it contains some pretty painfully awful episodes. It’s often especially difficult to withhold groans and laughs in early TNG. But, sometimes we manage. We’re going for something that’s both fan commentary and analysis from a UCP perspective. We’re not going to force deep meaning into an episode where we don’t see it, nor overlook it when it’s thee (we hope). It only stands to reason that some episodes are going to have more serious content to discuss than others, but so far they’ve all been fun. It’s odd, though. Some really dopey episodes actually touch on great ideas and it’s been a very interesting ride. After taking a break over November and December, it feels good to be back at it. I hope you dig what we’re doing. Crap. Stop it, DS9! Stop it!! 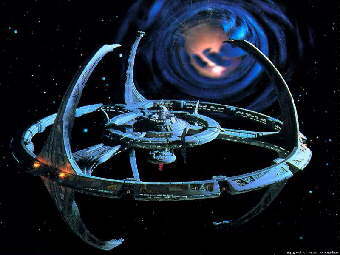 Although I love all the Star Trek series, Deep Space 9 adds complexity to the universe. We are forced to confront the unpleasant side of humanity and realize that Roddenbury’s ideal world can be shattered by human frailties. What is a dream world without trials to help fans appreciate it? Christian teachings also emphasize growing our faith through trials and suffering. I’m visually impaired so I’ve always wondered what those tube grubs looked like anyway! Yeah, I really appreciate DS9 for asking important questions about how Star Trek‘s ideals can be upheld in a world that is so far from them and when the systems built to safeguard those ideals break down due to human frailty. The same is true for Christians. Many of the murky ethical situations DS9 deals with reflect the kind of struggles we have when we attempt to give our faith arms and legs and a beating heart in the real world, as well as the ways in which political systems and struggles present challenges of their own. And tube grubs kinda look like big maggots. Ug, who’d want to eat tube grubs, lol! Apparently, just about every Ferengi. And Ben Sisko. He once made a dish for Jake with tube grubs in the sauce! And, if I’m being honest, the part of me that would kinda like to try some fried grasshoppers one day would be curious at least. But fried. They must be crispy. And not wiggling. Fried grasshoppers! You are braver than I am but I really want to leave our universe and travel the stars so I’d have to change my dietary preferences a bit! Smile, I’ll stick with the paste or whatever our current frontiers eat! or maybe someone will be brilliant enough to invent a replicator sometime in our lifetime! Yes, and then the amazing replicator technology will become just another nuisance of modern life and we’ll wish for something better.